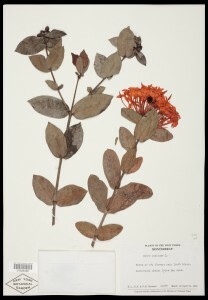 Michael Bevans is the Information Manager for Digitization at The New York Botanical Garden Herbarium. The William and Linda Steere Herbarium at The New York Botanical Garden houses over 7 million plant specimens gathered from around the world over the course of 250 years. Plants supply most of the world’s food, fuel, shelter and medicine, and plant specimens help us answer the most critical questions facing our planet. How many species are there and how are they related? What environmental factors control their growth? And how do plants respond to climate change? Now you can help scientists to better understand our planet by transcribing plant specimen labels in our newly released crowd sourcing effort, hosted by the Atlas of Living Australia. Choose an expedition studying the Oaks of North America or the Plants of the Caribbean. Click the “Start Transcribing” button to log in and get started. To learn more about the William and Lynda Steere Herbarium, make sure to watch “Treasures of New York: The New York Botanical Garden” this Thursday, June 27th at 10:30pm on Channel Thirteen.